I will start with a recent publication with the title Crystallographic Snapshot of an Arrested Intermediate in the Biomimetic Activation of CO2. The nature of this intermediate caught the eye of another research group, who responded with their own critique‡ along with the comment “However, since we have no access to the original crystallographic data …” They might have been referring to the semi-processed data (containing the so-called hkl structure factors) but they may also have been alluding to the raw image data captured directly from the diffractometer cameras. That traditionally has not been available via the CSD (Cambridge structural database), but would be required for a complete re-analysis of the crystal structure. Now the first example of how both FAIR (processed) data and raw data can co-exist has appeared. There is more. 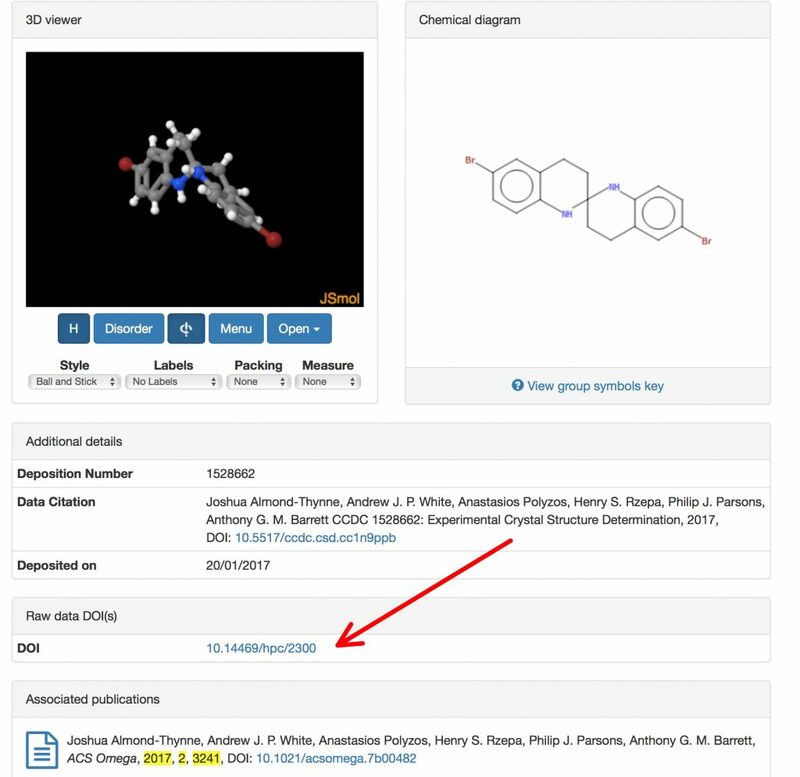 The Raw dataset (10.14469/hpc/2300) declares it is a member of a superset, called Crystal structure data for Synthesis and Reactions of Benzannulated Spiroaminals; Tetrahydrospirobiquinolines (10.14469/hpc/2297) where you can find information about six other related structures. That collection is in turn a member of a superset called Synthesis and Reactions of Benzannulated Spiroaminals; Tetrahydrospirobiquinolines (10.14469/hpc/2099) where DOIs to other types of data associated with this project can be found, such as Computational data (10.14469/hpc/2098) and NMR data (10.14469/hpc/2294). Although a human can with some determination follow these associations up, down and across, the system is designed to also be followed by automated algorithms that could traverse this web quickly and efficiently. So you can now see that a crystal structure held in the CSD could be the starting point for a journey of FAIR data discovery, in manner that has not hitherto been possible. How quickly the CSD will become populated by links to Raw (and other) data remains to be seen. I have not yet discovered any mechanism for specifying a CSD query which stipulates that Raw data must be available, but no doubt this will come. To end, back to the Biomimetic Activation of CO2 referred to at the start. With no access to the original data, recourse was made to computational modelling. Which where I came in, since I wanted access to the original (computational) data. Sadly it did not appear to be available with the article, in much the same manner as the original complaint. Perhaps, when FAIR data becomes fully accepted as part of how science is done nowadays, such complaints will become ever rarer! ‡In fact the original authors did respond with an acknowledgement that their original conclusions were not correct. †Almost. The article  cites DOI: 10.14469/hpc/2099 (Ref 28), but it does not cite DOI: 10.5517/ccdc.csd.cc1n9ppb because the latter had not been minted yet at the time the final proofs were corrected, and there is no mechanism to add it at a later stage. This entry was posted on Thursday, December 7th, 2017 at 1:28 pm and is filed under Chemical IT, crystal_structure_mining. You can follow any responses to this entry through the RSS 2.0 feed. You can leave a response, or trackback from your own site.